There is an aura attached to both the functions of gathering intelligence and the intrepid persons involved in gathering it. The myths, mystiques and mysteries appended to investigative bureaus have spawned generations of bestselling thrillers, and edge-of-the-seat movies besides instituting a noble and elite sense of brotherhood against which every other assemblage and association reads almost plebeian. When a former Deputy Director of one the most revered and reviled intelligence agencies in the world decides to pen his memoir, it is time to sit up and take notice. Andrew G. McCabe, the former Deputy Director of the Federal Bureau of Investigation (FBI) and one of the ‘unfortunate elites’ in a burgeoning rank of officials to have been fired via Twitter, has penned a rousing indictment, if not a measured polemic against a President who operates on instinct, indiscretion and injudiciousness. He also, in a rapid fire, ‘Usain Boltesque’ fashion takes his readers through the path that an Agent traverses in his transformation from an absolute novice to a seasoned veteran. McCabe himself was relentlessly hounded and targeted by Trump over the issue of his wife’s failed bid for a seat in the Virginia legislature. Finally, things came to a head in March 2018, when with less than a paltry two days to go before his retirement, McCabe was given the boot by the volatile and abrasive Jeff Sessions, on a recommendation from the FBI Office of Professional Responsibility (OPR). Justifying the removal of McCabe, Sessions alleged that McCabe “made an unauthorized disclosure to the news media and lacked candor” during an OPR review of the FBI and justice department’s handling of an investigation into the Clinton Foundation. Soon after this act, Sessions was also unceremoniously sacked joining a long Ferris Wheel of candidates fast falling out of Trump’s favour. 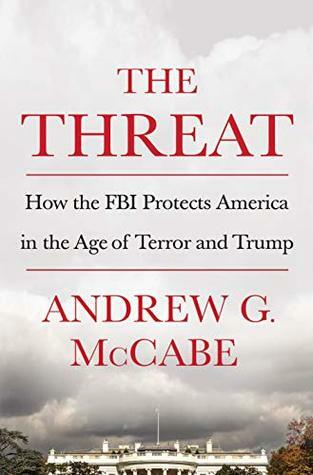 “The Threat” joins the company of a books that depict the dangerous and debilitating tide that threatens to engulf the United States. The prominent culprits include Josh Green’s “The Devil’s Bargain”, James Comey’s “A Higher Loyalty,” and Bob Woodward’s “Fear: Trump In The White House.” Such litany of woes must render the reader worried if not downright scared. The very edifice of institutions that have otherwise stood the test of both time and turmoil is now being seriously being jeopardized, to cater to the divisive, deadly and degenerating whims and fancies of one demented individual. You know (or at least you strongly suspect), that your sibling is a notorious murderer on the run, and consequently the focus of a massive man hunt by the cops. You also happen to know the whereabouts of the elusive fugitive and you harbor this eerie suspicion that his victim count has definitely not ended. Under such a circumstance with whom will your loyalties lie? With your own flesh and blood or with the civic society of which both of you are a vital part. If you are Senator William Bulger, the former President of The Massachusetts State Senate, Massachusetts University and the brother of the still ‘at large’ criminal Whitey Bulger, (subsequently Whitey Bulger was captured in 2013 after 16 years on the run. His blood lust and unleashing of terror spawned a plethora of books and films. Whitey was ironically beaten to death in a West Virginia prison. He was 89 years old when he died), you will argue that familial solidarity triumphs over civic responsibility. However if you happen to possess the bent of mind characterizing David Kaczynski, the brother of the infamous “Unabomber” Ted Kaczynsy, societal responsibility will over ride familial ties. But between William and David, who made the just and equitable, or rather moral decision? The most engaging political philosopher living and expounding today in our midst, Michael Sandel proposes to tackle precisely such issues of conflict. In this refreshingly riveting read, Professor Sandel exhorts us to evaluate and re-evaluate our moral priorities and pre-conceived notions regarding the salient aspects of justice. Drawing on the theories of Jeremy Bentham (utilitarianism) Immanuel Kant (Categorical imperatives), John Rawls (from behind a veil of ignorance) and Aristotle (Politics and the Good Life), Professor Sandler reigns supreme in his assertions and assumptions. Abhorring paternalistic and condescending language, Michael Sandler succeeds in bringing home the most indispensable and rudimentary tenets of Political Philosophy, to grasp which, one need not even be a student of the subject. Justice – Choose to ignore at your own peril!